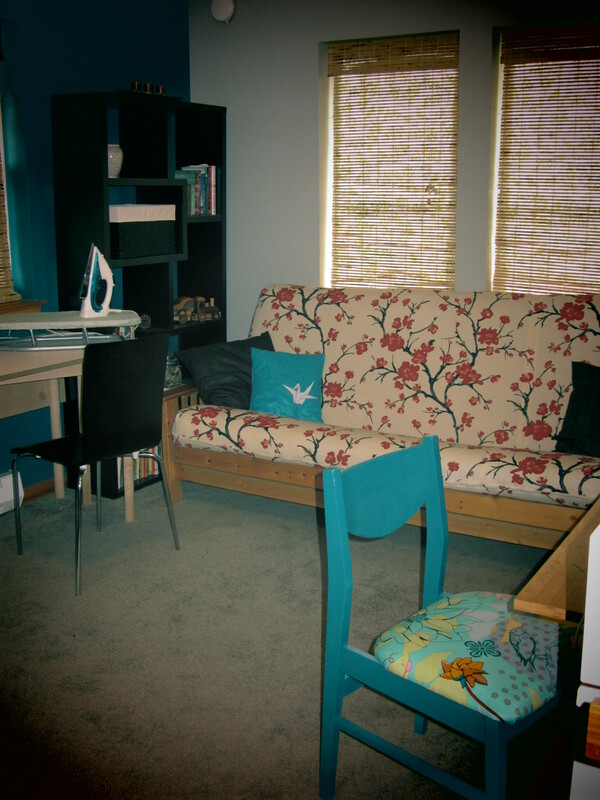 I did my first my home improvement project last year – well first one that I shelled a lot of money out for, that is. I had my side porch expanded so I could actually use it. I figured evening and weekend work when the sun is out would be much more enjoyable if I was outside. Plus it will give me outdoor space to entertain and an added bonus was covering up a chunk of the yard that used to need weeding. Since it was finished last fall I haven’t really had a chance to use it and so was stuck with sticker shock. But my friends and family have my back and have been helping me make it useable and cozy and pretty so I’m excited about it again! I have my great-grandparent’s colorful garden chairs and my nephew painted me a glittery turquoise pot and wooden flower for my birthday. Then the big birthday evening… I came home to find a grill from a friend – and promises to teach me how to use it :). 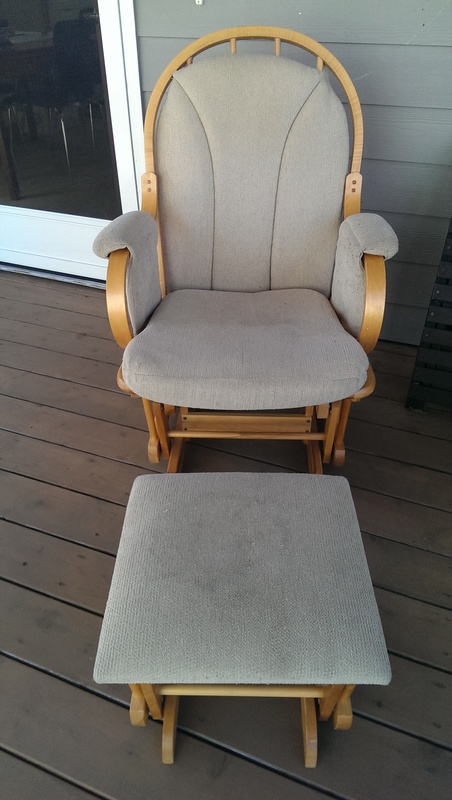 I’d just finished setting it up when another friend appeared with a glider rocker he’d found for free that will make a great reading/work/nap chair. Finally… the pretty but empty porch is filling up with functional pieces that make me feel loved & happy every time I’m out there. 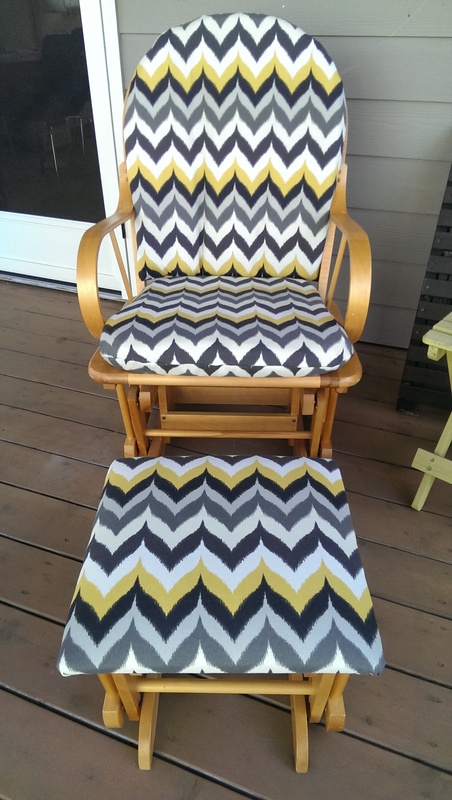 The sunny Sunday we had today was the inspiration I needed to recover the glider to add a good punch of color to the porch and make it mine (and cover the cushions with outdoor friendly fabric). I wasn’t completely sure the strategy in my head would work, but figured I had nothing to lose so I dove in. The padded arms were the first to go (comfy maybe, but the look of the bentwood arms wins out) and I was happy to see all that was left were two stand alone cushions and the footstool top. 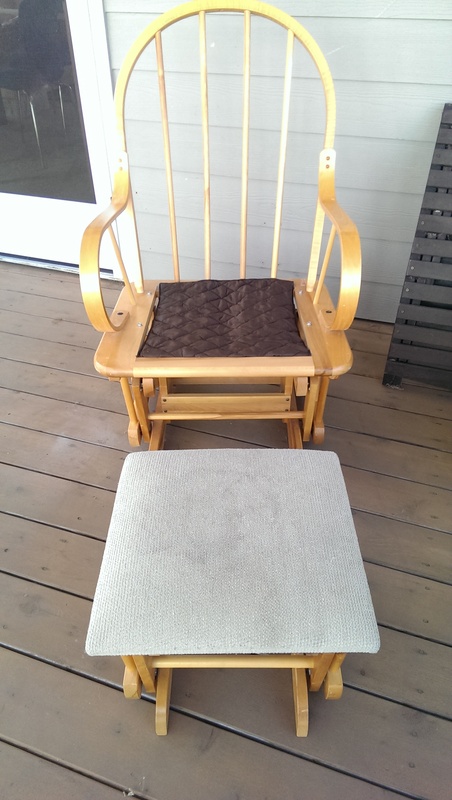 The footstool was easy – I know how to work the staple gun! For the cushions, I wrapped them in the new fabric and used lots and lots of pins to fit the cover. Then sewed it most of the way, slid it back over the cushion and hand sewed it closed. Bingo, a brand new chair! Now that I have the best craft table ever! 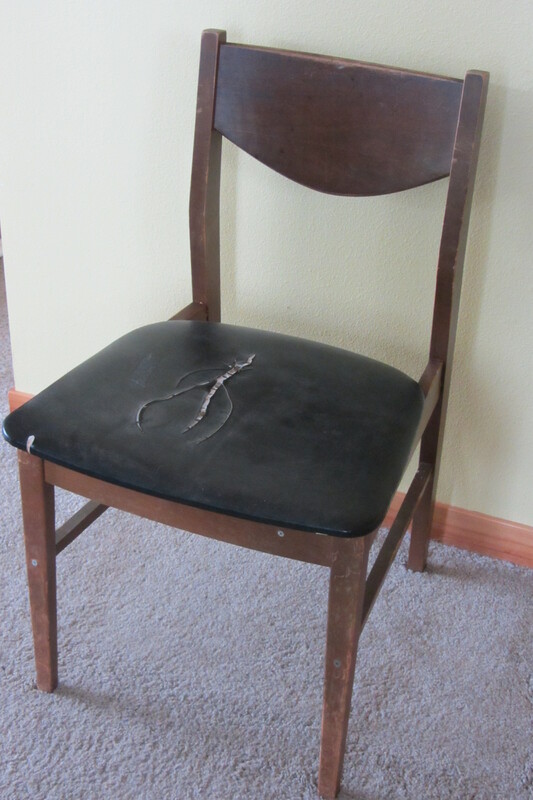 (photos coming soon, I promise) I needed a chair to go with it. I few months ago I snagged this freebie outside my office. 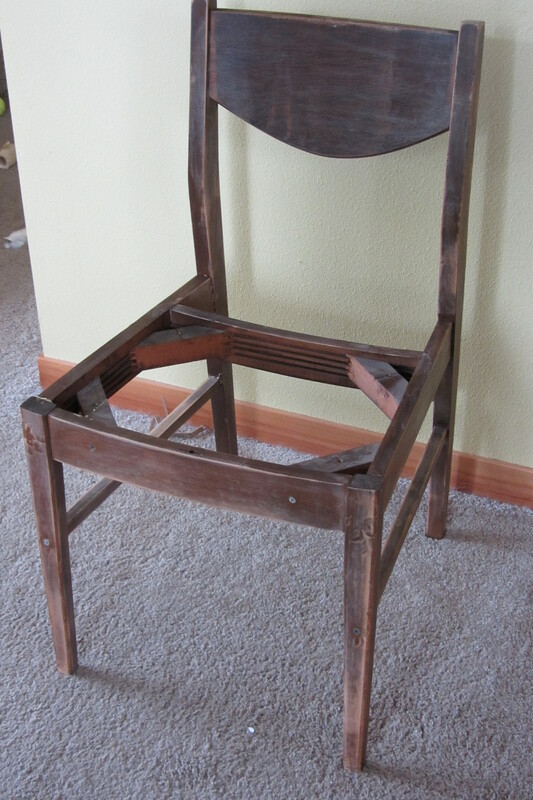 Not pretty, but simple and an easy chair to spruce up. Dusting it and taking it apart was step one. Then I sanded down the frame a bit before painting. Then the fun part… painting. I have a love hate relationship with painting. I love how easy it is t make a huge change to something, but I always get bored part way through. Luckily this still managed to be just an afternoon project. I’ve gone back and forth on the color for this chair, white, grey or turquoise… I have all of them available as leftover wall paint. I finally went with my gut… turquoise! 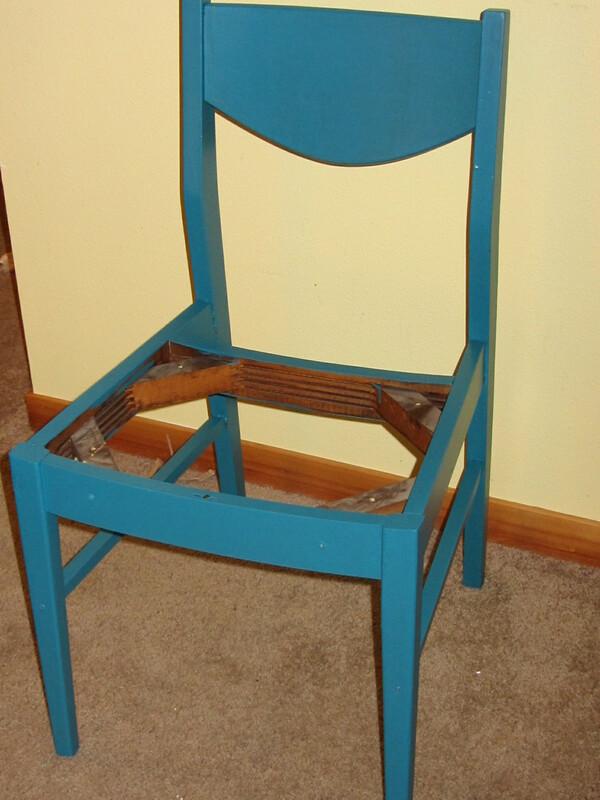 No need to play it safe with a chair, so I might as well pick the fun color. Fabric for the seat was the toughest part… I even bought a couple different fabrics and of course ended up finding the perfect fit in my scrap stash! (well now I have new fabric calling for new projects I guess…). 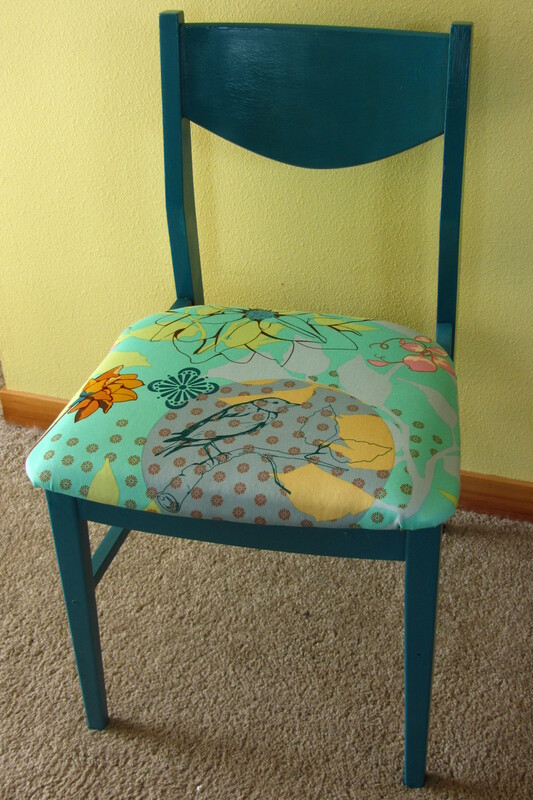 I’ve always loved this fabric and the dark turquoise matched the paint perfectly. Ironic too, because I originally bought this fabric to recover chairs for the office. 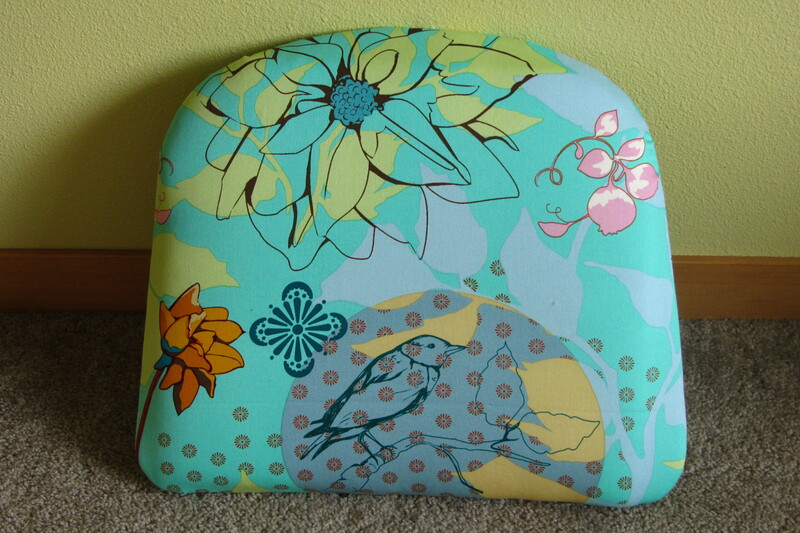 While the frame dried, I recovered the seat (adding a bit more foam because it was really hard & flat…). It was coming together so well and I had to make myself wait until the paint was completely dry. Nothing like watching paint dry… But it did and I got to put the pieces back together. 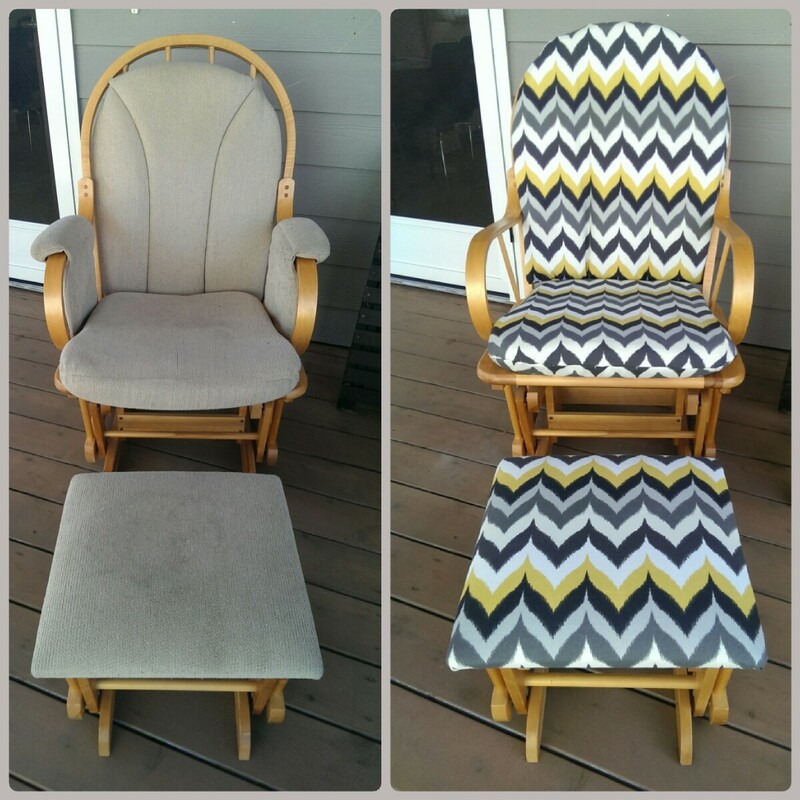 A perfect fun craft chair!